Biogas is a modern renewable energy source and potentially a lucrative source of income for many farmers. Its special feature is the generation of electricity, heat and fertiliser from biomass. Combustible gases are produced by anaerobic fermentation and putrefaction processes. Depending on the source material, biogas basically contains methane, carbon dioxide and water vapour. A fermenter consists of an airtight round silo, which is connected to a gas tank madeofafilm. The objective is to create a constant fermentation process so that the combustion can take place constantly with maximum efficiency. Depending on the gas quantity, the gas tank film inflates due to increasing pressure. The fill quantity to be fermented can be determined from the bulge ofthe film. To date, inductive limit switches which measure the bottom, middle and top position of the film have been used to measure this. 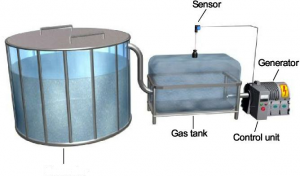 This discrete measurement of the fill quantity did not take account of the inertia of the fermentation process and made the control ofthe biogas generation inefficient. 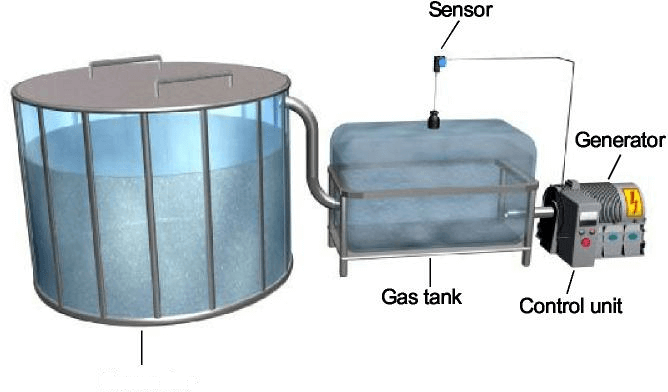 The fill quantity in the fermenter can be measured continuously by using draw-wire sensors. A weight is attached to the film for a constant pressing force, which keeps the sensor wire tensioned. The sensor is located in the generator building and is connected to the weight on the film using wire extensions. The measured distance also changes as the expansion of the film changes. The distance between film and displacement sensor increases as the filling quantity in the gas tank decreases. The control unit reduces the speed of the generatordue to the increase ofthe displacement signal in orderto restore the target fill quantity in the gas tank. Therefore, the efficiency of the biogas generation and combustion is increased many times as the fill quantity is measured at each point in time of the fermentation process and new fermentation material can be added if necessary.